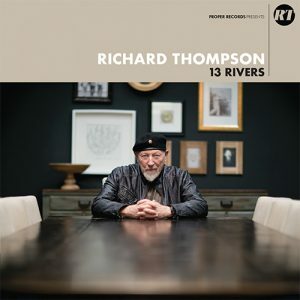 Richard Thompson is set to return with 13 Rivers on September 14 2018, the 13-song set is the Grammy nominated artist’s first self-produced album in over a decade and was recorded 100% analogue in just ten days. It was engineered by Clay Blair (The War On Drugs) and features Thompson’s regular accompanists Michael Jerome (drums, percussion), Taras Prodaniuk (bass), and Bobby Eichorn (guitar). A high water mark in an overwhelmingly impressive career, 13 Rivers was recorded at the famed Boulevard Recording Studio in Los Angeles. Previously known as The Production Workshop, which was owned by Liberace and his manager, the locale served as the site for seminal classics by Steely Dan, Fleetwood Mac, Ringo Starr, and hosted the mixing sessions for Pink Floyd’s legendary The Wall. 13 Rivers commences on the tribal percussion and guitar rustle of “The Storm Won’t Come” as the artist bellows, “I’m looking for a storm to blow through town.” The energy mounts before climaxing on a lyrical electric lead rife with airy bends and succinct shredding from the guitar virtuoso.